Axiom updates approximately 350,000 threat data points per day with over 150 updates during the day with a very low memory impact on the device. Even the smallest Mikrotik hAP device can be connected without any degradation of throughput or inspection. Pick the Perfect Package for you Axiom Shield - Threat intelligence that is intelligent. I tried signing up for Axiom Shield but I get a message "Account Not Activated"
Don't worry, your account has been successfully created. All you need to do is go to the email account that you used when registering and click on the "Account Activation" link. With what RouterOS versions is Axiom Shield compatible? Technically, Axiom Shield is compatible with RouterOS versions back to 6.2x however due to discovered vulnerabilities and the fact that you should never miss a firmware or RouterOS patch, we highly recommend that all our clients make sure they are on the latest firmware and RouterOS versions. Why can I only select 10 licenses? For larger orders, please contact us at shield@axiomcyber.com. We can provide volume pricing and you can submit a CSV of all your serial numbers and we will bulk upload them into the system. Why do I need to provide my Hardware ID? We control access to Axiom Shield through the Hardware ID. Only licensed MikroTik RouterOS devices may connect and receive updates from Axiom Shield. Where do I find my Hardware ID? Your results should look like the following, we need the “Serial-Number” field to complete the licensing process. What protections does Axiom Shield add to my MikroTik devices? Axiom is 100% invested in improving cyber protection utilizing Mikrotik devices. Our team has developed the Axiom Polymorphic Threat Defense System that pulls in over 100 open and closed sources of threat intelligence and provides up-to-date threat information to our clients to protect against ransomware, tor (DarkWeb), torrenting, and more. Tor exit nodes change every 30 minutes and threat vectors are constantly evolving, so should your cyber protections. 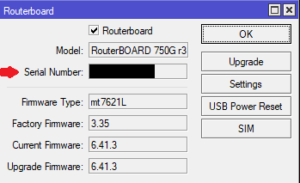 My MikroTik has a firewall? Yes! Mikrotik’s firewall capabilities outperform some of the most expensive and elaborate firewall solutions from the “other guys”. It is considered next-generation which means it can do Deep Packet Inspection (DPI) and also track connections like a stateful firewall but also able to filter up to Layer 7. At Axiom, we utilize these tools to protect networks at the ingress to stop repeat offenders from probing or attempting to penetrate your network. We also catch a lot of stuff going out the egress such as ransomware, tor (DarkWeb), torrenting, and more. Where should Axiom Shield be deployed in my network? 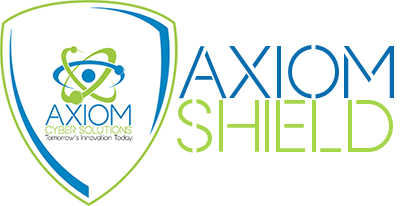 Axiom Shield can be applied to any RouterOS device anywhere in your network. If you are a fully invested MikroTik customer from Router to Access Layer, it makes sense to layer your protections. Security-in-Depth is the best and only way to ensure adequate protections. The faster Axiom can stop an attack, the less resources are consumed and the faster you can be alerted to a problem. If you are unhappy about current firewall performance or protections, Axiom can discuss replacing your existing solutions with a MikroTik solution. How does Axiom Shield work with my existing MikroTik devices? Once you purchase a license, you will be able to download a RSC script and instructions for installation. The RSC file will connect your device to the Axiom Polymorphic Threat Defense System and receive updated threat feed information. You will need to provide the device serial number that will be used by Axiom for authentication with the platform.